After clearing customs and immigration, the group will be transported to the hotel for the evening. Immerse yourself in the Thai culture. After breakfast the group will hit all the top sightseeing spots in Bangkok - some truly amazing sights that are guaranteed to leave you speechless! With our expert local guide we will see: The Grand Palace, The Emerald Buddha Temple, Wat Pho - Reclining Buddha, and More! 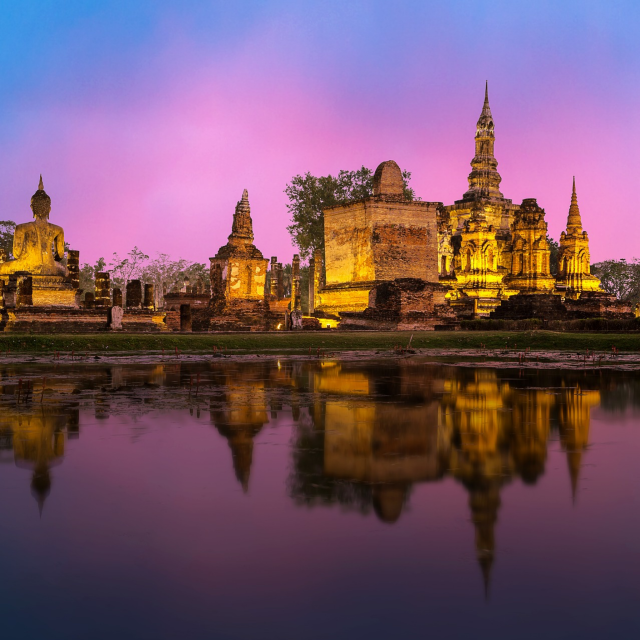 After checking out of the hotel you will travel 75 kilometers north to the former capital of Thailand, Ayuthaya. Beginning in the mid-16th Century, Ayuthaya rose to prominence and became a major seaport and trading city before being sacked in 1767. We will start the tour at the summer palace of the late King Rama V, continuing on and seeing the ruins of the early splendor that is Ayuthaya. We will see all the major and most impressive ruins on our tour. We will travel to the Bangkok airport upon check out of the hotel and grab a short flight to Chiang Mai, located in northern Thailand. After arriving we will have a short excursion to Wat Phrathat Doi Suthep (built in A.D. 1384). With its location of 3,500 feet above sea-level, we can see a panoramic view of Chiang Mai city. Afterwards we will visit the hill tribe village of White Meo. Following this we will be transported to our accommodations. We will leave early in the morning and be transported north of Chiang Mai to Mok Fah waterfall, for swimming and relaxation. After a short drive and lunch we will begin an approximate 3.5 hour trek to a hill tribe village at Baan Pa Kao Lam. We will get to walk around and experience the local culture and lifestyle of the hill tribe people, ending the day with feeding and bathing elephants. Today we will be trekking for about an hour to our bamboo rafting point and raft along the Taeng River through many rapids. We will be able to stop at various villages along the way and will get a real sense of the Thai culture. After rafting we will be transported back to Chiang Mai and our accommodation. The final three days of our trip will focus on a little R&R. We will take a short flight to the island paradise of Koh Samui. There we will have three days of leisure time. You can explore the island and/or just simply hangout on one of the beaches. Thailand is known for its pristine beaches and clear blue water! On the tenth day we head back to the airport to begin our journey home! Entrance Tickets to All the Locations and Events we Travel To. Full Time Tour Director That Will Travel Everywhere With You and Expert Guides at all the Locations. A Sense of Community as you Travel Around With the HIKEhoppers Group. A Chance to Visit a New Country and Have an Amazing Experience! With our friends from Bursch Travel Agency we guarantee the lowest price possible. A $500 nonrefundable deposit is due upon booking and payment plans are available! Check out below for the quoted price of the trip! Please Note: Prices are subject to change based on number of people attending the tour, availability of flights, and other factors. Currently we are negotiating airfare, this requires that we keep the trip dates flexible until flights are set. IF we can negotiate the flights for less than we anticipated we will pass the savings on to you. The window for the trip is JUNE 3 through June 30. Flights will be leaving from the Minneapolis/Saint Paul International Airport. All payments are non refundable! Just curious? Share your info below and we will send you a detailed itinerary and more information!